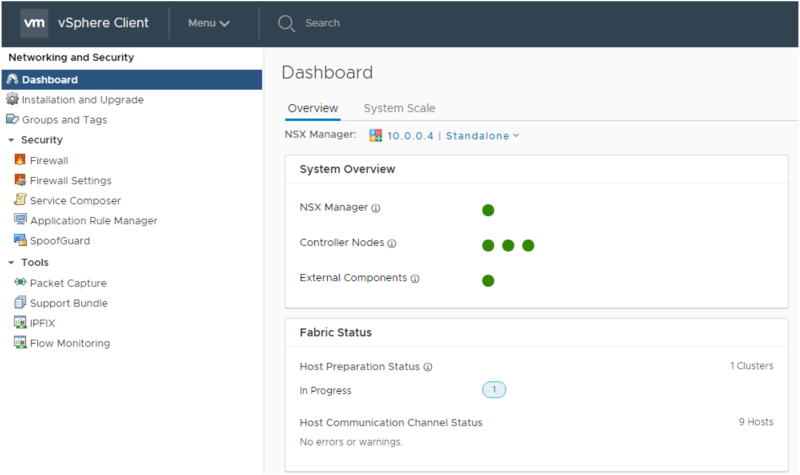 Released: NSX-v 6.4.1 New Features and Fixes - VIRTUALIZATION IS LIFE! Last week VMware released NSX-v 6.4.1 (Build 8599035) that contains a some new features and addresses a number of resolved issues from previous releases. I will go through the new features in more detail below however a key mentions is the fact that vSphere 6.7 is now supported, also meaning the vCloud Director can now be used with NSX-v 6.4.1 fully supported on vSphere 6.7. Prior to that only 6.5 was supported by NSX-v meaning you couldn’t upgrade to vSphere 6.7 as vCloud Director is dependant on NSX-v which didn’t support 6.7 until this 6.4.1 release. There is also a small, but cool automatic backup feature introduced that backs up the state of the NSX Manager locally prior to the upgrade. Going through the release notes there are a lot of known issues that should be looked at and there are more than a few that apply to service providers. The NSX User Interface continues to be enhanced and additional components added to the HTML5 Web Client. As you can see below, there are a lot more options in the HTML5 Web Client compared to the 6.4 base release…to reference that version menu, click here. As you can see, the following VMware NSX features are now available through the HTML5 vSphere Client. Installation, Groups and Tags, Firewall, Service Composer, Application Rule Manager, SpoofGuard, IPFIX and Flow Monitoring. VMware is maintaining a web page that show the current NSX for vSphere UI Plug-in Functionality. I really like how the HTML5 interface is coming along and i’m now using it as my primary tool over the Flex interface. Looking at Security Services are improvements in the Firewall by way of additional layer 7 application context support for Symantec LiveUpdate Traffic, MaxDB SQL Server support and support for web based Git or version control. There is also extended support via the Identity Firewall for user sessions on RDP and application server which now covers Server 2012 and 2012 R2 with specific VMTool versions. The NSX Load Balance now scales to 256 pool members up from 32 which is a significant enhancement to an already strong feature of the NSX Edges. 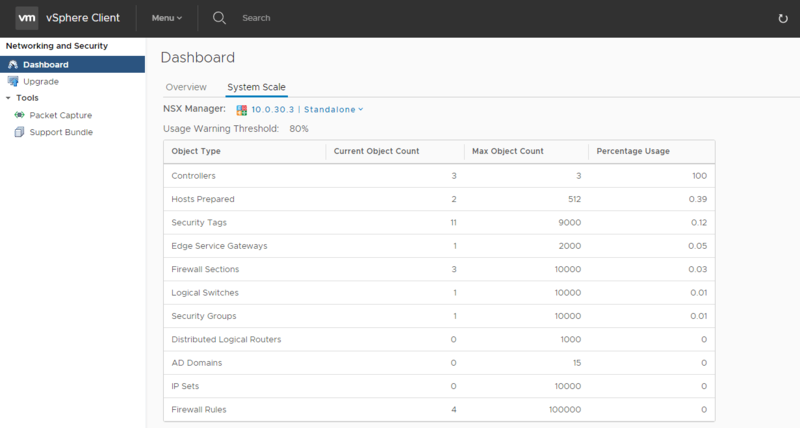 There are also a number of enhancements to overall operations and troubleshooting pages. Those with the correct entitlements can download NSX-v 6.4.1 here. NSX for vSphere 6.2.x will reach End of General Support (EOGS) on August 20 2018.